Early Humans - HISTORY'S HISTORIESYou are history. We are the future. 1. AUSTRALOPITHECUS AND ARDIPITHECUS: On a routine trip outside their research camp in 1974, archaeologists David Johanson and Tom Gray came upon a remarkable discovery near Hadar, Ethipia. They first spotted a forearm bone, then part of a skull. Over the next several weeks, several hundred additional bone fragments were found. All in all, Johanson and Gray's discovery yielded 40% of a human skeleton, all from a single hominid. What is more remarkable is that the bones the two found were 3.2 million years old. The archaeologists named the skeleton Lucy. Lucy's bones are significant because, at the time they were discovered, they represented the oldest hominid species ever found. Then, in 2009 the discovery of Ardi rewrote all that scientists had previously believed about human origins. At 4.4 million years old - more than 1 million years older than Lucy - Ardi is our oldest hominid ancestor to date. 2. HOMO HABILIS - "HANDY MAN": After digging for several years in the Olduvai Gorge, Tanzania in eastern Africa, Mary and Louis Leakey announced the discovery of a new species of early human in 1964. Due to its ability to both use and to make tools, they named their find Homo habilis, which means "handy man." Like Lucy and Ardi before them, Homo habilis lived in Africa. Physically, however, Homo habilis was taller and had a larger brain. Those superior physical traits may be traced directly to the ability of Homo habilis to use stone tools. The simple tools used by Homo habilis led to more success scavenging food and that led to an increase in the amount of protein these early humans ate. 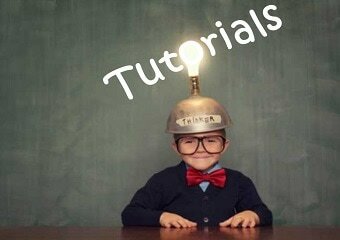 The additional protein aided brain development. One other advantage that Homo habilis had over her predecessors was the ability to use fire. The ability to use fire meant that they could safely travel farther than any previous hominids. 3. HOMO ERECTUS - "UPRIGHT MAN": While hunting for the “missing link” between apes and humans in 1891, Dutch paleoanthropologist, Eugene Dubois discovered remains of what came to be known as Homo erectus. 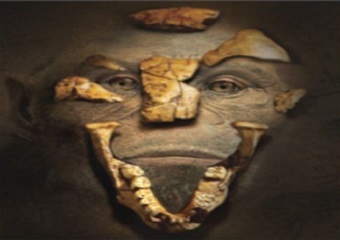 At the time of his discovery, Homo erectus represented the oldest known hominid species. Homo erectus is nearly as tall as modern humans and, compared with earlier hominid species, had much advanced tool-making skills. 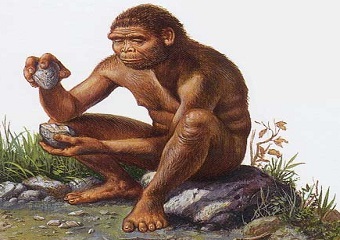 The advanced tools allowed Homo erectus to become the first true hunter. Even more important was his ability to make and control fire. The ability to control fire led to safer food preparation. Cooking food meant protein-rich meat was easier to eat and that, once again, led to more rapid brain development. 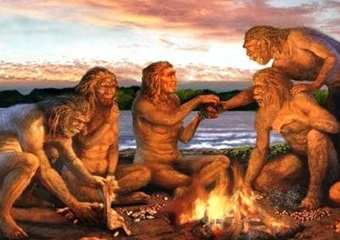 The ability to make fire not only meant that Homo erectus lived a more secure life than his ancestors did, it meant that Homo erectus could also move into distant, colder climates. Because of that, Homo erectus was able to migrate out of Africa and began populating the rest of the world. 4. HOMO NEANDERTHALENSIS - PRE-MODERNS: A skull found in 1856 in the Neander Valley, Germany, set off the 19th century hunt for human beginnings. Neandertals take their name from the German valley where these first discoveries were made. 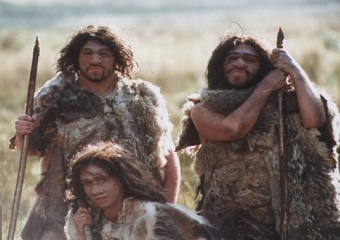 Neandertals are special because of their advanced tool making capabilities. Neandertals made tools to be used for specific purposes. They made fishing hooks, sewing needles, and sharp bone and stone-tipped spears. With the skins from the animals they hunted, they sewed together warm boots and clothing that allowed them to move into very northern climates. Neandertals buried their dead with ceremony, suggesting that Neandertal was the first to think about an “afterlife” or have religious beliefs. While Neandertals and modern humans shared a common ancestor, the Neandertal line of DNA died out about 30,000 years ago. 5. HOMO SAPIEN - EARLY MODERNS, "WISE MAN": The first remains of our early-modern ancestors were discovered in France in 1868. 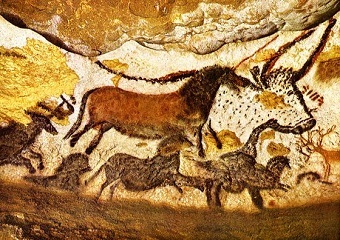 The name of the cave in which the remains were discovered was Cro Magnon, so for years this species was referred to as Cro-Magnon Man. Now, however, they are more commonly called “early-moderns.” Early-modern people lived at the end of the last ice age, roughly between 40, 000 and 10,000 years ago. They looked a lot like us and seemed to value many of the same things, like home, family, art, and community. They were advanced tool makers and experienced hunters. They created bows and arrows and spear-throwers, and their success on the hunt allowed them to remain in one place for longer periods of time. Therefore, they built semi-permanent dwellings with central hearths that served as both a heat source and as a social gathering place. Many of these dwellings were built to serve an entire community.